“Connex Labyrinth”, Image by fdecomite. When you want to invite someone new into your LinkedIn network, the social business platform provides users with a simple formatted email making it easier to do this. It reads in part “I’d like to add you to my network”. Recently, a research team published the results of their work proving that a similar network effect 1 occurs not only among people, but also in a comparable manner among new ideas. As a result of such inventive schmoozing, ideas plus other new ideas can now be seen as yielding all kinds of unexpected links to innovation 2. This “mathematical model for the emergence of innovations” mapping out all these processes was published by the School of Mathematical Sciences at Queen Mary University of London, as reported in a fascinating article about an exciting advance on Phys.Org in a story entitled Mathematicians Develop Model for How New Ideas Emerge, posted January 24, 2018. (No writer is credited.) This article is a summary of the full paper by the research team responsible entitled Network Dynamics of Innovation Processes that appeared in the Physical Review Letters (subscription required), published on January 26, 2018. I highly recommend a click-through and full read of the Phys.org article, including its two accompanying visualizations. I will recap and annotate some of the key points in this piece and then pose some of own questions about how and why ideas may either swipe left or swipe right when trying to meet up with each other. The research team was led by Professor Vito Latora, who was also the lead author of the paper. They found that by “studying creative processes and understanding how innovations arise” and, furthermore, how [mathematical] “novelties” can lead to additional discoveries, the results of these interactions can lead to “effective interventions” that could support the “success and sustainable growth” in our society. Similar patterns have been seen in scientific and artistic fields 3. This was accomplished by first transposing the theory of the ‘adjacent possible’ from its original field of biological systems into, second, the “language of complex networks“. The former describes the “set of all novel opportunities” that arise whenever a new discovery appears. The latter has become a reliable means to study actual systems in the real world by examining the key relationships “between the components” and, in turn, modeling the “hidden structure behind many complex social phenomena”. In effect, network modeling has been applied here to construct the “underlying space of relations among concepts”. Indeed, some very cool and productive connections are occurring within such idea-fueled networks. Professor Latora further believes that understanding the key elements of a successful idea are critical to later making decisions, forming strategies and supporting successes. He thinks that such results can be part of “sustainable growth in our society”. Another new methodology was derived during the course of his team’s research: The concept of “reinforced walks” (as a subset of “random walks“, a form of mathematical object 4), was used as the basis to model the interaction among concepts and ideas. During all of this activity “innovation corresponds to the first visit of a site on the network”, as well as every time such a “walker”, as termed in the article, transits from one concept to another concept. The more this type of path is traveled, the more it becomes reinforced and thus productive. This network dynamic, named by the team as the “edge-reinforced random walk“, is clearly diagrammed and further described in the Phys.Org article’s first graphic. In an actual case study applying this methodology, the research team built a database of 20 years’ worth of publications from a diversity of fields including “astronomy, ecology, economics and mathematics”. This was done to examine the emergence of new concepts. Their results of applying their edge-reinforced random walk model to this compilation was that they succeeded in reproducing evidence of the growth of knowledge in contemporary science. Professor Latora and his team are currently working to extend their model by studying network spaces where several of these “walkers” are operating simultaneously 5. Can edge-reinforced random walks be adapted and applied to additional non-scientific and non-artistic domains such as history, politics and culture? That is, can it yield meaningful results and insights in sectors of society that are less data-derived? How is this methodology distinguishable from various branches of artificial intelligence where vast stores of data are used to “train” the capabilities of these systems? Can edge-reinforced random walks also be deployed as a form of predictive device? For example, what if a great deal more data from a larger diversity of fields was similarly compiled and tested, would this provide a partial preview into the future in science, technology and biology? For a comparative perspective, albeit a dated one published 18 years ago, on how human social systems and their interactions will still be needed in the all-encompassing “Information Age”, I suggest a book that is still considered a significant achievement for its time entitled The Social Life of Information, by John Seely Brown and David Duguid (Harvard Business Review, 2000). 1. 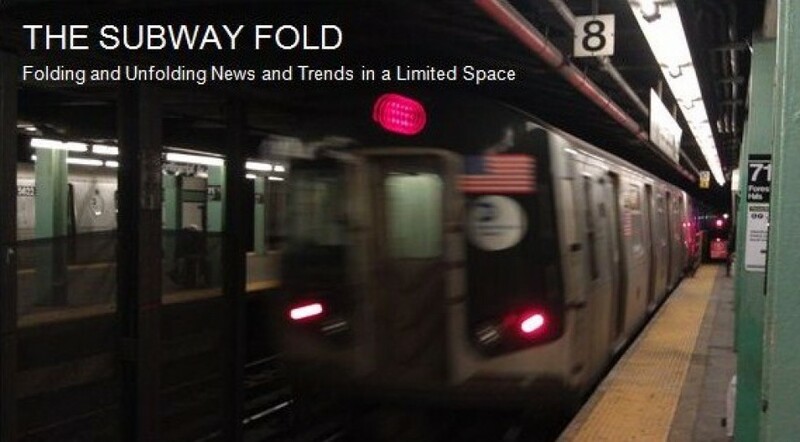 Network effects among people, populations and technologies have also been explored in these 10 Subway Fold posts. 3. Another example is the study of laws and legal precedents in this manner as described in this May 15, 2015 Subway Fold post entitled Recent Visualization Projects Involving US Law and The Supreme Court. 5. In an entirely different context, fans of The Walking Dead will also appreciate how large groups of walkers manifest their own distinctly emergent behaviors. 6. The leading text on this subject is The Black Swan: Second Edition: The Impact of the Highly Improbable, by Nassim Nicholas Taleb (Random House, 2010). * Boldly displays the power of using visualization to understand the structure, dynamics and power of networks. * Provides inspiration to explore these examples for their educational and analytical values. * Displays the critical importance of carefully designing the structure of the manner in which data are being transformed into a display. * Motivates visitors to consider the possibilities of applying visualization to their own professional projects. As well, in a clear case of the merger of art and science, many of these of these visualizations are, imho, often quite aesthetically pleasing images that likewise stand on their own as works of art.